Archbishop Martin of Dublin shocked Catholics recently by using the term “homophobia” (as Pope Francis shocked the world by referring to “gays”). The archbishop has, in the past, shown himself to be sympathetic to and tolerant of the homosexual agenda – click on the photo to read more and then click here to read about the funeral of the homosexual pop star whose “husband” was publicly recognised by the priest during the funeral service in Dublin. A number of concerned laity wrote to the archbishop about this, including the editor of Catholic Truth, but were ignored. The clergy grapevine say this is not unusual, that Archbishop Martin “never answers letters” even to his priests, apparently. Well, if it’s true, as Belloc claims, that “the grace of God is found in courtesy” that tells us a lot about the Archbishop of Dublin. The invitation to known homosexual activist, Fr Timothy Radcliffe to address a conference in Dublin, is the latest evidence of the archbishop’s support for the homosexual rights movements. All the publicity surrounding this invitation, with calls for the organisers to withdraw the invitation, were ignored – notably by the person with responsibility for squashing dissent and refusing dissenters a platform – Archbishop Martin. The Legion of Saint Joseph was responsible for the Rosary protest at Father Timothy Radcliffe’s talk at the Divine Mercy Conference in Dublin on 22nd February. We are a group of lay people who are fed up of the wishy-washy talk from the majority of priests and bishops. Father Radcliffe has expressed views which are repugnant to Catholic moral teaching e.g. that civil unions are acceptable. We call on His Grace Archbishop Martin of Dublin, in whose diocese this conference took place, to state in unequivocal terms the constant teaching of the Church, that civil unions are not acceptable nor any other legal instrument which encourages or condones unnatural lifestyles. We call on other Catholics attached to the unchanging teaching of the Church to make their voices heard and to resist as much as they can, even publicly against those who would undermine the doctrine given to us by Saint Patrick. END. 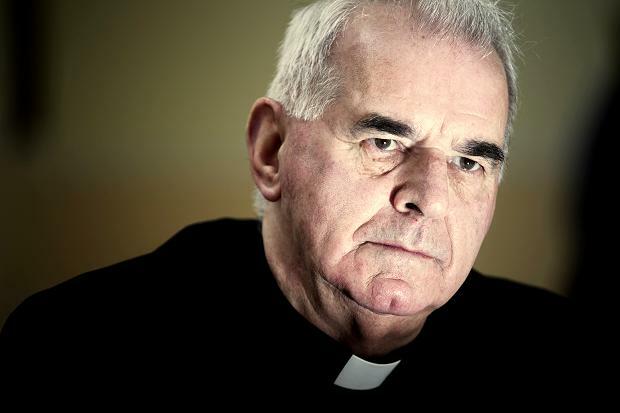 Is the Archbishop of Dublin likely to rise to this challenge from concerned Irish Catholics? And what about that prompt to the consciences of fellow laity – will they rise from their slumber to defend the Faith and God’s natural moral order? I know what I think. What do you think? CARDINAL Keith O’Brien is facing a new investigation by the Vatican and may face a “trial” under canon law which could lead to him losing his red hat. Three priests in the Archdiocese of St Andrews and Edinburgh have asked Leo Cushley, the new archbishop, to pass on to the Holy See their written complaints which characterise O’Brien as a “sexual predator” who used his authority to compel them into “coercive” and “abusive” sexual relationships. The priests, whose accusations led to the cardinal’s enforced retirement and disgrace last February, appear determined to force Pope Francis to make a final judgment. It is now understood that O’Brien’s sexual relationships continued until at least 2009, six years after he was made a cardinal. Last year, Francis ordered O’Brien to remain in a Catholic religious house in England for three months of “prayer and penance”. However, since this period has now elapsed he has been free to come and go as he pleases but has chosen to remain at the religious house. The three priests, as well as a fourth former priest of the diocese, had initially dealt with the papal nuncio, the Pope’s ambassador in London. However, the diocesan priests have now entrusted Cushley, a former Vatican diplomat, who prior to his appointment, worked closely with Pope Francis and his predecessor Pope Benedict XVI, to convey to Rome the treatment they received at the hands of the cardinal. The documents detailing their allegations have now been sent by Archbishop Cushley to the Congregation of Bishops, from where they are expected to be passed to the Secretariat of State. Under canon law, the legal framework that governs the Catholic Church, only the Pope can pass judgment on or “sentence” a cardinal. One possible outcome is that a “promoter of justice” is appointed to the case and asked to investigate the allegations. Both sides may be viewed by the Vatican as guilty of the “canonical crime” of breaking a commandment – thou shalt not commit adultery – a catch-all for sexual sins. However, it will be the responsibility of the promoter, who acts like a procurator fiscal in Scots law, to determine if O’Brien was guilty of behaviour that would warrant further punishment in light of his senior position. Last May, O’Brien returned to Scotland with a view to retiring to a house belonging to the Archdiocese of St Andrews and Edinburgh in Dunbar. However, he was then ordered by Pope Francis to move to the religious house in England. Since the cardinal’s period of penance and prayer has elapsed he has made several trips to Scotland to visit friends, including a New Year visit to the home of Canon Matthew McManus at Saint Peter-in-Chains in Ardrossan for an annual reunion with priests with whom he studied. The fact that the cardinal is still being pursued by his alleged victims begs a number of questions. Firstly, that his very public humiliation, with screams of “hypocrisy” from every corner, doesn’t seem to be enough to satisfy the priests who engaged in homosexual activities with him. So far, I’ve yet to be convinced that anyone could be “coerced” into such behaviour merely because they didn’t want to annoy the boss. Doesn’t wash. So, what’s going on? Is this a case of “victims” seeking justice or … revenge? Secondly, who are these accusers? Why is the media protecting their identities? Journalists know who they are, so it’s a puzzle as to why – contrary to popular custom – they are not being named. Is it because the lifestyle and behaviour of said “victims” would not withstand close scrutiny? Maybe the cardinal isn’t the only hypocrite here. Who knows? Should the accusers show some integrity and identify themselves? Tell us your thoughts on this latest news about the cardinal including whether or not, in your opinion, he should be compelled to hand back his red hat. I mean, red isn’t really his colour anyway, is it? From 23rd February to the 1st March 2014 Scotland’s Catholic schools and parishes will celebrate how they support children and young people to ensure that they are “Shining the Light of Faith” in their daily lives. This theme has been inspired by the first Encyclical of Pope Francis: ‘Lumen Fidei’ (The Light of Faith). Archbishop Philip Tartaglia said: “During Catholic Education Week, we can all do that little but more to “shine the light of faith” in our lives. In doing so, not only do we respond positively to our own vocation, we become lights for our young people, our hope for the future”. To read Archbishop Tartaglia’s message for Education Sunday please click here. Why are Catholics losing the Faith? Over and over again on this blog we find contributors arguing that this or that sacrilege (e.g. Communion in the hand) is acceptable because permitted by the bishops. Below, therefore, find the chapter on True and False Obedience, which is taken from Archbishop Lefebvre’s Open Letter to Confused Catholics. But does the distinction really matter? If someone is going along with what is permitted out of a spirit of obedience to their bishop, isn’t that a good thing? Or more likely perhaps, as Archbishop Lefebvre argues, is it a case of “That way there is nothing left for you but to lose your faith.” ? Indiscipline is everywhere in the Church. Committees of priests send demands to their bishops, bishops disregard pontifical exhortations, even the recommendations and decisions of the Council are not respected and yet one never hears uttered the word “disobedience,” except as applied to Catholics who wish to remain faithful to Tradition and just simply keep the Faith. In the Rogation-tide litanies the Church teaches us to say: “We beseech thee O Lord, maintain in Thy holy religion the Sovereign Pontiff and all the orders of ecclesiastical hierarchy.” This means that such a disaster could very well happen. In the Church there is no law or jurisdiction which can impose on a Christian a diminution of his faith. All the faithful can and should resist whatever interferes with their faith, supported by the catechism of their childhood. If they are faced with an order putting their faith in danger of corruption, there is an overriding duty to disobey. It is because we judge that our faith is endangered by the post-conciliar reforms and tendencies, that we have the duty to disobey and keep the Tradition. Let us add this, that the greatest service we can render to the Church and to the successor of Peter is to reject the reformed and liberal Church. Jesus Christ, Son of God made man, is neither liberal nor reformable. On two occasions I have heard emissaries of the Holy See say to me: “The social Kingdom of Our Lord is no longer possible in our times and we must ultimately accept the plurality of religions.” This is exactly what they have said to me. Well, I am not of that religion. I do not accept that new religion. It is a liberal, modernist religion which has its worship, its priests, its faith, its catechism, its ecumenical Bible translated jointly by Catholics, Jews, Protestants and Anglicans, all things to all men, pleasing everybody by frequently sacrificing the interpretation of the Magisterium. We do not accept this ecumenical Bible. There is the Bible of God; it is His Word which we have not the right to mix with the words of men. When I was a child, the Church had the same faith everywhere, the same sacraments and the same Sacrifice of the Mass. If anyone had told me then that it would be changed, I would not have believed him. Throughout the breadth of Christendom we prayed to God in the same way. The new liberal and modernist religion has sown division. Christians are divided within the same family because of this confusion which has established itself; they no longer go to the same Mass and they no longer read the same books. Priests no longer know what to do; either they obey blindly what their superiors impose on them, and lose to some degree the faith of their childhood and youth, renouncing the promises they made when they took the Anti-Modernist Oath at the moment of their ordination; or on the other hand they resist, but with the feeling of separating themselves from the Pope, who is our father and the Vicar of Christ. In both cases, what a heartbreak! Many priests have died of sorrow before their time. In the Diocese of Campos in Brazil, practically all the clergy have been driven out of the churches after the departure of Bishop Castro-Mayer, because they were not willing to abandon the Mass of all time which they celebrated there until recently. Divisions affects the smallest manifestations of piety. In Val-de-Marne, the diocese got the police to eject twenty-five Catholics who used to recite the Rosary in a church which had been deprived of a priest for a long period of years. In the diocese of Metz, the bishops brought in the Communist mayor to cancel the loan of a building to a group of traditionalists. In Canada six of the faithful were sentenced by a Court, which is permitted by the law of that country to deal with this kind of matter, for insisting on receiving Holy Communion on their knees. The Bishop of Antigonish had accused them of “deliberately disturbing the order and the dignity of religious service.” The judge gave the “disturbers” a conditional discharge for six months! According to the Bishop, Christians are forbidden to bend the knee before God! Last year, the pilgrimage of young people to Chartres ended with a Mass in the Cathedral gardens because the Mass of St. Pius V was banned from the Cathedral itself. A fortnight later, the doors were thrown open for a spiritual concert in the course of which dances were performed by a former Carmelite nun. Two religions confront each other; we are in a dramatic situation and it is impossible to avoid a choice, but the choice is not between obedience and disobedience. What is suggested to us, what we are expressly invited to do, what we are persecuted for not doing, is to choose an appearance of obedience. But even the Holy Father cannot ask us to abandon our faith. If we were more resolute on this subject, we would avoid coming to the point of gradually absorbing heresies. At the beginning of the sixteenth century the English underwent an experience of the kind we are living through, but with the difference that it began with a schism. In all other respects the similarities are astonishing and should give us cause to ponder. The new religion which was to take the name “Anglicanism” started with an attack on the Mass, personal confession and priestly celibacy. Henry VIII, although he had taken the enormous responsibility of separating his people from Rome, rejected the suggestions that were put to him, but a year after his death a statute authorized the use of English for the celebration of the Mass. Processions were forbidden and a new order of service was imposed, the “Communion Service” in which there was no longer an Offertory. To reassure Christians another statute forbade all sorts of changes, whereas a third allowed priests to get rid of the statues of the saints and of the Blessed Virgin in the churches. Venerable works of art were sold to traders, just as today they go to antique dealers and flea markets. Only a few bishops pointed out that the Communion Service infringed the dogma of the Real Presence by saying that Our Lord gives us His Body and Blood spiritually. The Confiteor, translated into the vernacular, was recited at the same time by the celebrant and the faithful and served as an absolution. The Mass was transformed into a meal or Communion. But even clear-headed bishops eventually ac-cepted the new Prayer Book in order to maintain peace and unity. It is for exactly the same reasons that the post-Conciliar Church wants to impose on us the Novus Ordo. The English bishops in the Sixteenth Century affirmed that the Mass was a “memorial!” A sustained propaganda introduced Lutheran views into the minds of the faithful. Preachers had to be approved by the Government. During the same period the Pope was only referred to as the “Bishop of Rome.” He was no longer the father but the brother of the other bishops and in this instance, the brother of the King of England who had made himself head of the national church. Cranmer’s Prayer Book was composed by mixing parts of the Greek liturgy with parts of Luther’s liturgy. How can we not be reminded of Mgr. Bugnini drawing up the so-called Mass of Paul VI, with the collaboration of six Protestant “observers” attached as experts to the Consilium for the reform of the liturgy? The Prayer Book begins with these words, “The Supper and Holy Communion, commonly called Mass…,” which foreshadows the notorious Article 7 of the Institutio Generalis of the New Missal, revived by the Lourdes Eucharistic Congress in 1981: “The Supper of the Lord, otherwise called the Mass.” The destruction of the sacred, to which I have already referred, also formed part of the Anglican reform. The words of the Canon were required to be spoken in a loud voice, as happens in the “Eucharists” of the present day. The Prayer Book was also approved by the bishops “to preserve the internal unity of the Kingdom.” Priests who continued to say the “Old Mass” incurred penalties ranging from loss of income to removal pure and simple, with life imprisonment for further offences. We have to be grateful that these days they do not put traditionalist priests in prison. Tudor England, led by its pastors, slid into heresy without realizing it, by accepting change under the pretext of adapting to the historical circumstances of the time. Today the whole of Christendom is in danger of taking the same road. Have you thought that even if we who are of a certain age run a smaller risk, children and younger seminarians brought up in new catechisms, experimental psychology and sociology, without a trace of dogmatic or moral theology, canon law or Church history, are educated in a faith which is not the true one and take for granted the new Protestant notions with which they are indoctrinated? What will tomorrow’s religion be if we do not resist? Such is the secret of true obedience.